This video is of Cooper taking his first steps walking... It's fun seeing his expressions as he learns this new mode of transportation! 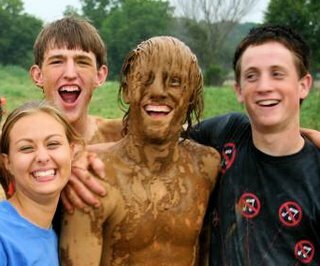 This fall, Student Venture West Plains (MO) put on an event for incoming freshmen called the “Mudbowl”. This was designed to be fun, high energy, and a little over the top. We got permission to use a 60’ x 100’ section of land owned by a local soccer club. We plowed up the land and had the local fire department pour several thousand gallons of water on it to make it good and muddy. To make sure it was muddy enough, we had several trucks drive (and spin!) around on it until the mud was about a foot deep throughout the entire 6000 square foot area. In the course of the event, two upperclassmen shared about their relationship with Christ and challenged the freshmen to start their high school experience with God. One of the students, Amanda, shared about how her sophomore brother died in a car accident 6 months earlier giving her perspective that life is short and uncertain. She went on to share the Gospel and encouraged the students to place their faith in Christ. Twenty-seven students indicated that they did and 25 others requested more information about Student Venture. By the end of the night, after the mud fights were over, and everyone was completely covered, the fire department hosed everyone down and many teenagers went home with a new sense of hope and purpose in their life.